One of the most common questions I am asked regularly concerning my priesthood is: "Aren't you worried that you're going to be alone since you won't have a family of your own?" It's a thought that crosses (I think I'd be safe in saying) every priest and seminarian's mind. The question stems from the thought that since I won't have a family and kids of my own, that I will wind up in a situation with no one around me. But actually, the life I chose through the guidance of the Holy Spirit is truly a blessed life filled countless wonderful relationships. Take for example the last 5 days. As I write this blog post, the Labor Day Weekend has just concluded as well as the first football weekend over at Notre Dame. 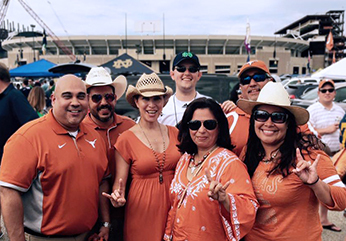 I had the pleasure of hosting two families from St. Ignatius Martyr Catholic Church, the parish I was previously assigned to in Austin, TX for the weekend as they traveled up from Austin for the UT vs. ND game. These two families opened their doors and their hearts to me last year while I was a Deacon and we have maintained our friendship since I arrived in South Bend at St. Joe Parish. On Friday evening, Fr. Kevin Russeau csc, pastor of St. Joe parish, and myself hosted the two families from Austin as well as a family from St. Joe for dinner. Two seminarians, Chris Brennan csc and Brendan McAleer csc, joined us as well. It was a beautiful moment of community as everyone came together and shared a meal as well as many moments of laughter and joy. On Saturday, I hosted a tailgate prior to the Notre Dame game that brought together many more families that made the trip from St. Ignatius as well as families here in town. My own parents were also in town and they joined us as well. As we sat outside and talked, everyone there mentioned how Holy Cross has a way of bringing people together. 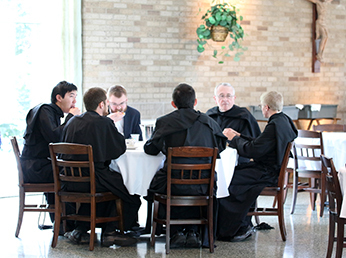 On Monday, the St. Joe Parish community hosted the other Holy Cross priests from our neighboring parishes in South Bend for a cookout. It was a wonderful opportunity to grow together in our brotherhood with each other. We opened our gathering with evening prayer in the church and enjoyed some great food and conversation. Later that evening, after dinner, the younger religious of Holy Cross gathered online for our Annual Fantasy Football Draft that provides another opportunity for brotherhood through a common interest. All of these Community events occurred in the last 5 days! Living in the community of Holy Cross has enabled me to enter into many relationships that I never would have had the opportunity to engage into prior. Our Constitutions state, "Our vows not only bind us in community; they are to mark our life as community. Open and generous and hospitable love is to characterize our houses and our service." It is in faithfully living our vows that we can grow in our community life. But, it is also in the witness that our brothers and sisters in Christ live as married couples and families, bearing witness to the Church and Christ's relationship to the Church that we also grow in community. My priesthood and religious life is enhanced by the faithful witness lived out by our brothers and sisters in Christ and I cannot imagine living life any other way. Fr. Dan Ponisciak, C.S.C., took his Final Vows with the Congregation of Holy Cross in the fall of 2014, and was ordained a priest in the spring of 2015. He was assigned to St. Ignatius Catholic Parish in Austin, Texas during his transitional Diaconate. He was recently re-assigned to St. Joseph Parish in South Bend, Indiana. Fr. Dan is originally from Philadelphia, Pennsylvania.